If your child has been diagnosed with a large deletion, I highly recommend that eye exams be performed regularly. See Eye Issues for more information. The majority of AS cases are caused by deletions on the maternal copy of Chromosome 15. 15q11.2-q13. Due to genomic imprinting, only the maternal copy of UBE3A is expressed in the brain. The deletion thus removes the normal expression of this gene in AS individuals. I was a moderator for the Deletion Positive session at the 2013 ASF Orlando Conference. Much to my embarrassment, I learned something new from an audience member! The children who have a Deletion Positive diagnosis are currently grouped into classifications. The deletions that cause Angelman syndrome usually fall into two size categories. The larger has been termed the Class I deletion, and the smaller has been called Class II deletions. Class III deletions are those that are atypical and often are larger than even the class I deletions. Dr. Lynne Bird, Clinical Genetics/Dysmorphology and Professor of Clinical Pediatrics, University of California, San Diego. Dr. Bird is a participant in the Angelman Natural History Study. ***The red arrow is pointing to the deletion on the area of Chromosome 15 that results in hypopigmentation. Our 35 year-old son doesn’t mind going to the dentist. He goes twice a year to the same pediatric dentist he started with as a preschooler. I thank this kind man every day. Our angel is thirty-three and her compassionate pediatric dentist says he’ll have her as a patient until he retires. (He has been her dentist since age three!) We like to take a bag of goodies for the staff every six months to show our appreciation! At the dental office we help the dentist along with two other people in order to do the work. 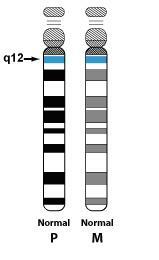 Angelman Syndrome is characterized by a partial deficit of paired autosomal chromosome 15, which contains a subunit of the GABA (Gamma-Amino Butyric Acid) receptor. Many drugs that act on the CNS (Central Nerve System) during anesthesia are believed to exert their effects via the GABA receptors. We describe the anesthesia of a 7 year-old female patient with Angelman syndrome who underwent surgery for dental caries. The basic factors that needed to be considered when administering anesthesia to this patient were epilepsy, significant dominance of the vagal tone, craniofacial abnormalities and peripheral muscular atrophy. Inhalational anesthetics (sevoflurane) were employed for this patient. The patient had an uneventful peri-operative period and was discharged home on the same day of the operation. The chromosome defect is responsible for the dysfunction of the GABA (Gamma-Amino Butyric Acid) receptor, as well as the damage to the synthesis and secretion of GABA. The GABA receptor is a common channel for the action of many drugs used for general anesthesia. Patients with Angelman syndrome have an impairment of this receptor, and need to be placed under general anesthesia even for a simple procedure. The anesthetic problems related to the syndrome involve seizures, hyperfunction of vagus nerves, malformations of the skull and facial bones, peripheral muscular atrophy, etc. We report a case of general anesthesia of a 7 year-old female outpatient with Angelman syndrome for the treatment of dental caries with a review of the relevant literature. This case shows that peripheral muscular atrophy in general anesthesia for outpatients requires more careful attention….. Therefore, it is reasonable to minimize or avoid administering an excessive dose of benzodiazepine to patients with this syndrome, and to refrain from using halogenated ethers as an inhalation anesthetic. From a theoretical viewpoint, intravenous anesthesia using a combination of propofol and fentanyl, which are not known to collide with the GABA system, will be safe. On the other hand, patients with AS can show symptoms of separation anxiety due to their severe mental retardation. For child patients who show separation anxiety at general anesthesia for outpatient surgery, securing an intravenous route after admitting the patients into the operating room accompanied by their parents and sedating them with inhalation anesthetics is desirable for reducing the children’s anxiety. Patients with this syndrome usually require general anesthesia for orthopedic surgery for the skeletal system dysfunction or even in a simple operation because they are uncooperative. AS may not be detected at birth or during infancy, and is revealed mainly after the age of four, when the characteristic behaviors and signs appear. Does the type of genetic cause of Angelman Syndrome make a difference in development? 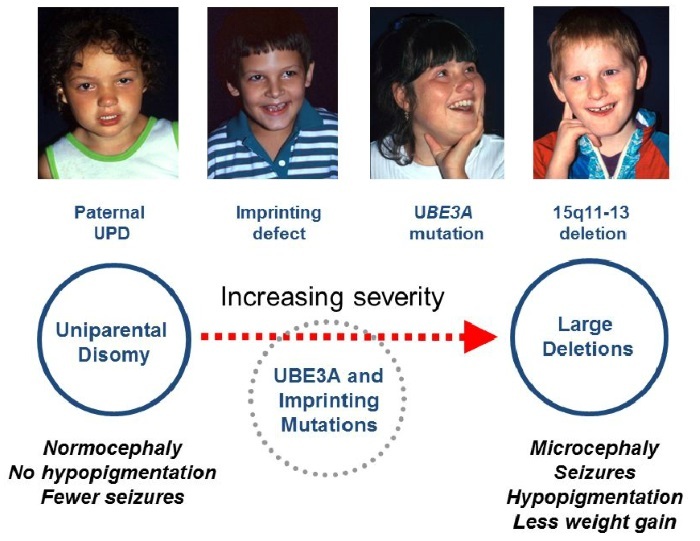 Dr. Charles Williams used the above illustration in his genetic presentation at the 2014 CASS (Canadian Angelman Syndrome Organization) conference. 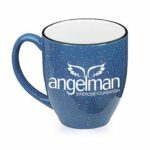 Go to the Angelman Syndrome Foundation website to watch a video to learn symptoms from families of individuals with Angelman Syndrome. Due to these similarities, misdiagnosis is a prevalent problem. Late or misdiagnosis may cause individuals to lose opportunities for early intervention programs, resources, personalized support and life-saving treatments. 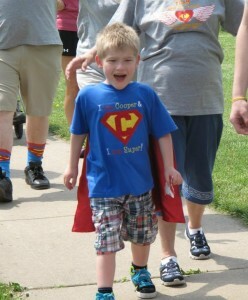 That’s why it’s important to increase awareness and understanding of Angelman syndrome, a disorder that occurs in roughly 1 in 15,000 live births. Prenatal history, fetal development, birth weight, and head circumference at birth are usually normal. Young infants with Angelman syndrome (AS) may have difficulties with breast feeding or bottle feeding (as a result of sucking difficulties) and muscular hypotonia. Gastroesophageal reflux may occur. Some infants have a happy affect with excessive chortling or paroxysms of laughter. Fifty percent of children develop microcephaly by age 12 months. Strabismus may also occur. Tremulous movements may be noted prior to age 12 months, often with increased deep-tendon reflexes. AS may first be suspected in a toddler because of delayed gross motor milestones, muscular hypotonia, and/or speech delay [Williams et al 2006]. Seizures typically occur between ages one and three years and can be associated with generalized, somewhat specific EEG changes: runs of high-amplitude delta activity with intermittent spike and slow-wave discharges (at times observed as a notched delta pattern); runs of rhythmic theta activity over a wide area; and runs of rhythmic sharp theta activity of 5-6/s over the posterior third of the head, forming complexes with small spikes. These are usually facilitated by or seen only with eye closure [Boyd et al 1997, Rubin et al 1997, Korff et al 2005]. Seizure types can be quite varied and include both major motor and minor motor types (e.g., petit mal, atonic) [Galvan-Manso et al 2005, Pelc et al 2008a, Thibert et al 2009, Fiumara et al 2010]. Infantile spasms are rare. Non-convulsive status epilepticus may occur [Pelc et al 2008a]. Brain MRI may show mild atrophy and mild dysmyelination, but no structural lesions [Harting et al 2009, Castro-Gago et al 2010]. The average child with AS walks between ages 2.5 and six years [Lossie et al 2001] and at that time may have a jerky, robot-like, stiff gait, with uplifted, flexed, and pronated forearms, hypermotoric activity, excessive laughter, protruding tongue, drooling, absent speech, and social-seeking behavior. Ten percent of children are nonambulatory. Sleep problems are well known in individuals with AS; frequent awakening at night is common [Bruni et al 2004, Didden et al 2004]. Dyssomnias (difficulties in initiating or maintaining sleep), irregular sleep-wake cycles, disruptive night behaviors such as periods of laughter, and sleep-related seizures have been reported [Pelc et al 2008b]. Essentially all young children with AS have some component of hyperactivity; males and females appear equally affected. Infants and toddlers may have seemingly ceaseless activity, constantly keeping their hands or toys in their mouth, and/or moving from object to object. Some behaviors may suggest an autism spectrum problem but social engagement is typically good and stereotypic behaviors such as lining up of toys or fascination with spinning objects or flashing lights rarely occur [Walz 2007]. Language impairment is severe. Appropriate use of even one or two words in a consistent manner is rare. Receptive language skills are always more advanced than expressive language skills [Gentile et al 2010]. Most older children and adults with AS are able to communicate by pointing and using gestures and by using communication boards. Effective fluent use of sign language does not occur [Clayton-Smith 1993]. 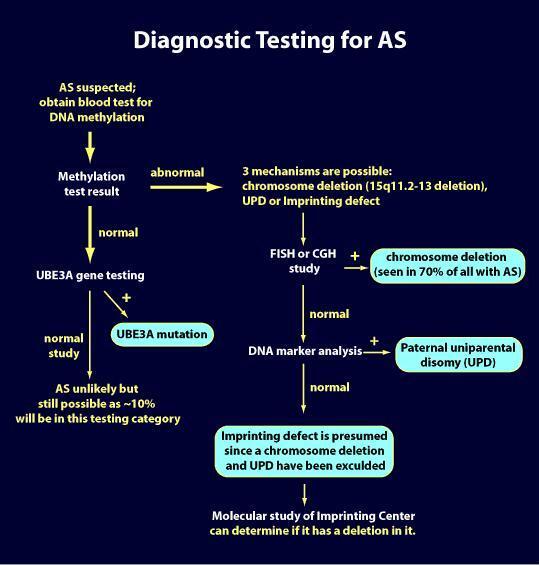 Pubertal onset and development are generally normal in AS. Fertility appears to be normal; procreation appears possible for both males and females. Lossie & Driscoll  reported transmission of an AS deletion to a fetus by the affected mother. Young adults appear to have good physical health with the exception of possible seizures. Constipation is common. Many are treated for gastroesophageal reflux symptoms. Scoliosis becomes more common with advancing age. Independent living is not possible for adults with AS; many live at home or in home-like placements. Life span data are not available, but life span appears to be nearly normal. Once our son Paul became eligible for Medicaid, we were given a list of authorized providers for incontinence supplies. Medicaid approved choices that were cheap and did not contain enough urine to keep him dry for more than a couple hours. They definitely did not keep him dry overnight, even when doubled with extra liners. We discovered that we could have our doctor write a prescription for a better quality brand based on diagnosis of extreme urinary incontinence and risk for skin breakdown. We were able to get the better diapers, but the script was only good for one year and had to be renewed. Whenever we forgot and the script expired, we started receiving the poor quality diapers again; so keep track of dates and get new script in plenty of time. We use Tranquility Smartcore diapers for the night and Tranquility Slimline diapers for the day. We have found that Maggie is very smart and needs to be taught to obey in a similar, but different way than her twin sister. Saying, “No, that can hurt” or “No, Maggie needs to obey!” seems to be working for now. Time out is the consequence if she does not listen or follow directions. We also keep our requests to those that are safety-related, hers or someone else’s. The more imminent or important the request, the more likely she is to follow it. Use lots of praise and hugs! Consistency is the key to success! My angel, Fayth (age 16 del +) has severe mood swings and has taken to pulling her sister’s hair when upset. When she does this we say, “NO” and put her in time out. She does this when tensions are high in her environment; when she is tired or frustrated; or when she seems jealous or upset by someone’s behavior. She seems to be seeking attention or trying to get her way when she does this, so for us removing her from whatever the situation is allows her to calm down. Then, we come back and ask for appropriate attention in ways that are acceptable. She has now started to remove herself from the room if she is getting angry or upset and she goes to sit in her room and play or take a rest. As a parent, it is your choice to discipline as you choose. However, as a teacher of forty years, I’d like to implore you NOT to use physical punishment. If you do, your angel will most likely respond by striking back and the negative behaviors will escalate. It is more effort to redirect negative behaviors and stay calm, but it truly works in the long run. Using physical punishment may provide you with an instant release of your anger and frustration, but the consequences can be dire! Since negative behaviors are often due to frustration and anxiety, I reassure my angel in a soft voice… “I understand… I know it is tough… Everything is going to be OK… Mom loves you very much, etc.” Be patient. Like any person, it takes awhile for the frustration and anxiety to calm. We use a straw or a water bottle with a spout, but when we don’t have one handy, I take a bottle of water with a regular cap and just punch a small hole in the lid. This way Tyler can drink with the lid on without spilling. Works great! We used the thicker aquarium tubing when we began training our daughter to use a straw. First, squeeze on the tubing to get liquid headed upwards and eventually your angel should catch on to the sucking of the tube/straw. It makes life much easier! My Angel does NOT like water so I have a little juice in a cup and I add water. As long as it has flavor I can get him to drink it. Most children with Angelman Syndrome drool to varying degrees. Some parents believe that the children drool more when they are outside and are warm. Parents of older children feel the problem improves as their child gets older, but it does continue. Some children have had surgery to help lessen drooling. However, several parents have reported that their child’s dentist does not recommend surgery since drooling may actually help prevent cavities since it helps to cleanse the teeth. Perhaps, an option for improving a drooling problem is occupational therapy. Since the problem may be rooted in swallowing difficulties and positioning of the tongue, an occupational therapist could offer tips for you and your child’s teacher. Request an occupational therapy consultation at your child’s IEP meeting.